It is that time of year when many of us choose a new calendar, either for ourselves or as a Yule gift. They do make excellent presents for pagans, especially if you pick one with lots of information about traditional festivals and moon phases as well as lovely artwork. So, following on from my post about choosing a pagan dairy, here are some of the pagan and witchy calendars for 2013. One of the most popular pagan calenders is the Llewellyn's Witches' Calendar. It includes articles, astrological data and magical correspondences, and the 2013 Llewellyn's Witches' Calendar also has a spell or ritual for each month. Article topics include gems for the cat goddess, balance and self awareness, the rewards of winter hibernation and garden magick. Llewellyn also produces a lovely Astrological Calendar. This has horoscopes and an introduction to astrology. Also shown in the photo on the right (which I took at the Mind, Body, Soul Experience in London, is the We'moon on the Wall 2013: The Other Side . I've not seen inside the 2013 calender, but it has the reputation of being an iconic feminist datebook as well as an astrological moon calendar and an earth-spirit guide to the cycles of nature. The We'moon website says: "We'Moon datebook's journey through 2013 is a profound and provocative exploration of 'The Other Side' - the many other sides: of the story, of the revolution, of birth/death, of mystery. Filled with brilliant art and writing, We'Moon 2013 is an extraordinary guide through the realms of transformation: our personal evolutions, our planetary shifts. The calendar pages inspire our inevitable, tantalizing journey, one beautiful week at a time." 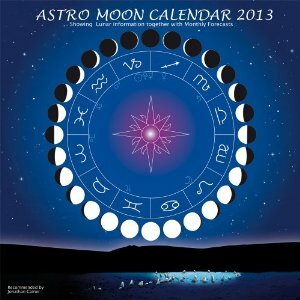 One of my favourite astrological calendars is the Astro Moon Calendar 2013. This is presented in a circular design showing the days following the cycle of the moon as she ebbs and flows. Each month includes the moon's daily phase and sign, an astrological forecast, a look at what is visible in the night sky, pagan festivals, sun and moon rise and set times, planetary sign changes, details of eclipses, retrograde and direct planets and information about the zodiac constellations. All the times in the Astro Moon Calendar are GMT. 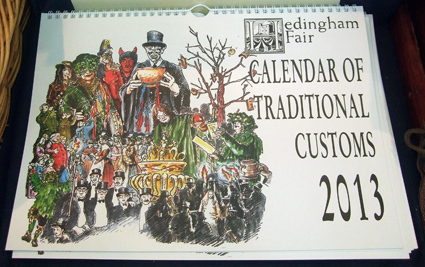 Another interesting and popular pagan calendar worth looking at is the Hedingham Fair Calendar of Traditional Customs, available through the Hedingham Fair website, This is full of information about folklore and traditions for the English year. You can see it pictured at the top of the page. Hedingham Fair also sells some lovely Yule cards through its website.